There is no shortage of movies built around high school reunions. The Best of Times. Peggy Sue Got Married. Grosse Pointe Blank. Romy & Michelle's High School Reunion. Just earlier this year there was American Reunion, a terrible, lifeless comedy that couldn't make us care about the adult lives of a group of characters even though we had already spent three movies with them. This year's much better reunion movie is the barely-released comedy drama 10 Years, written and directed by Jamie Linden. It's a high school reunion movie less concerned with looking back than with examining the present. It presents no real villains, nor characters with longtime scores to settle. It's not as good as Ted Demme's great Beautiful Girls, but it belongs much more in that conversation than it does with junk like American Reunion. 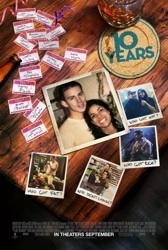 The "main" character of the movie, such as there is one, is Channing Tatum's Jake, who is attending his 10 year reunion with his girlfriend, Jenna (Tatum's real-life wife Jenna Dewan-Tatum), despite the fact that he's still not sure that he's over his high school sweetheart, Mary (Rosario Dawson). Also in his group of friends attending the reunion are Marty (Justin Long), a hotshot bachelor who moved to New York; AJ (Max Minghella), married and successful and determined to act as Marty's wingman for the night; Cully (Chris Pratt), a former hard-partying douchebag who may not have changed his ways; his wife, Sam (Ari Graynor), who has two kids and a husband she has to mother; Scott (Scott Porter), who has moved to Japan and has no interest in looking back and Reeves (Oscar Isaac), who has gone on to find major fame as a singer/songwriter. Rounding out the cast are Kate Mara, Aubrey Plaza, Anthony Mackie, Ron Livingston and Lynn Collins. Just read through that cast list again. If you're a fan of actors at all, 10 Years is worth seeing just for the impressive group that's been assembled. Even when I wasn't drawn into the movie -- and that was the case for the first 30 minutes (more on that in a second) -- I was willing to stay with it just because I wanted to follow these actors. Yes, there are probably too many people in the cast, and a few of them lean towards the generic, but for the most part it's a great group of warm, winning actors giving warm, winning performances. Nearly every member of the ensemble gets his or her moment, and each actor is able to make the most of it. For the first half, 10 Years very nearly drowns in the number of characters and story lines it has to service. It keeps jumping around, barely finding the time to establish each individual person, much less his or her plight. It bounces around doing a lot of table setting and familiarizing us with faces (but not names; I would be hard pressed to name many of the characters in the movie), and coasts by solely on the strength of its ensemble cast. Slowly, though, things start to come into focus and truths are revealed -- not major secrets or anything, just new information that puts much of what came before into perspective. There are still far too many characters in the movie; it could have easily done without Brian Geraghty's character, who surprises his wife (Aubrey Plaza) by revealing he used to be deep, deep into urban culture. Even Scott Porter, who plays one of the leads as the well-adjusted guy who has made a new life for himself in Japan, feels pretty extraneous (he's more of a Greek chorus than anything else), but at least he gets a pretty great speech near the end of the film that helps give shape to the overall thesis of the movie. Yes, the movie is often overly simplistic -- on paper, anyway. The majority of the characters can be reduced to one or two qualities: this one is unhappy in his marriage, this one is looking to score, this one peaked in high school, this one is looking for the One That Got Away. Nothing in the movie is all that original, and yet it still manages to sidestep most of the cliches of similar movies by keeping things small and grounded and real. Moments that would be big and obnoxiously on-the-nose in another movie are addressed with a single line of dialogue, or, in some cases, a silent exchange. Writer/director Linden always looks for the humanity throughout, whether it's in a genuinely moving exchange between Justin Long and Lynn Collins or in the sweet romance between Oscar Isaac and Kate Mara, whose storyline is one of the best things about the movie. Credit also to the film for having Isaac's character finally play his hit song (which has been built up throughout the movie) and having it actually be REALLY GOOD as well as advancing the plot. Those of use who sat through the end credits of Sucker Punch already knew that Isaac is a talented singer, but he's still a pleasant surprise here. 10 Years is essentially Can't Hardly Wait for an older set (which might sound like a criticism, but I'll willingly confess to having seen Can't Hardly Wait many, many times), gathering a bunch of familiar actors and character "types" for a 10-year high school reunion instead of a party on the last day of high school. Because the characters are older, the movie is much more grown up; it avoids Can't Hardly Wait's annoying tendency for broad comedy and instead opts for introspection without ever becoming too naval-gazing or mopey. Though it traffics in the familiar, 10 Years is not a movie of gigantic revelations. It is a movie of small truths, usually well observed. Of course, what really drew me to 10 Years (beyond my affection for the teen movie, even a post-teen movie like this one) is the presence of Channing Tatum. We here at F This Movie! have devoted a lot of time this year to reporting on our newfound love of People's Sexiest Man Alive (2012). Of his four (four!) movies released this year, his weakest performance is in 10 Years, lacking in the physicality of his work in Haywire, the humor of his great 21 Jump Street performance and the firing-on-all-cylinders movie star presence of Magic Mike. Here, he feels puffy and sleepy, not finding a character so much as a situation -- it's not bad work, but it's nothing special. There are two good things he brings to the movie, though: 1) he acts opposite his real-life wife, Jenna Dewan-Tatum (making this the Two of a Kind to Step Up's Grease), and they are sweet and genuine together, and 2) he was a producer on the movie, suggesting that his participation went a long way towards getting it made. If it means a choice between having 10 Years exist or not having it exist, I'm glad it exists. 10 Years is available on DVD and Blu-ray starting today. Thanks a bunch for this review Patrick. I agree that the first 30 minutes is a bit messy but it really is worth sticking with it. The Oscar Isaac and Kate Mara was very touching to me, I really loved that element of the story. I also really enjoyed Lynn Collins and definitely agree about the song! Soy la doctora Maria. Gracias por publicarlo..... El texto es amplio, entendible, claro, y fluido. Me gusto mucho tu blog...... Es el mejor post que he leido sobre este tema. Voy a compartirlo con mis amigos..... ¿Tengo una pregunta? ¿pudes profundizar mas sobre este tema?.... Muchas gracias, te deseo exitos con tu pagina web.